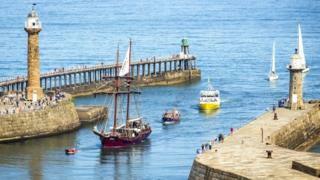 The £7.6m scheme to repair Whitby's crumbling piers is expected to begin in September, Scarborough council says. Flaws in the North Yorkshire town's piers, which protect hundreds of homes and businesses from flooding, had been found in an inspection by consultants in 2008. The East and West piers enclose the mouth of the River Esk where it flows into the North Sea. The piers are Grade II listed by Historic England. They were built in the 18th Century from sandstone, while extensions and footbridges were added in the early 20th Century. The repairs will include strengthening and maintaining the structure, removing damaged masonry blocks and replacing them with sandstone blocks, said the Local Democracy Reporter Service. The work will see removal of all marine growth and the repointing of voids between stones. It is hoped to be completed by January 2020. Consultants Royal Haskoning undertook a structural survey into the condition of the harbour piers and found cracks and other damage in 2008. It said at the time "urgent action" was needed to repair some of the damage and concluded the East Pier extension was "in a state of distress".